ADOPTED by Barb F of Lake Tapps WA!!! 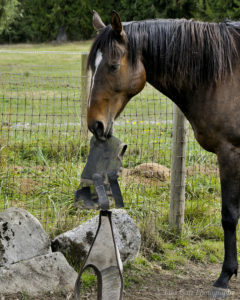 Kai’s Story: Kai was rescued, rehabilitated, and retrained by Pony Up Rescue for Equines. 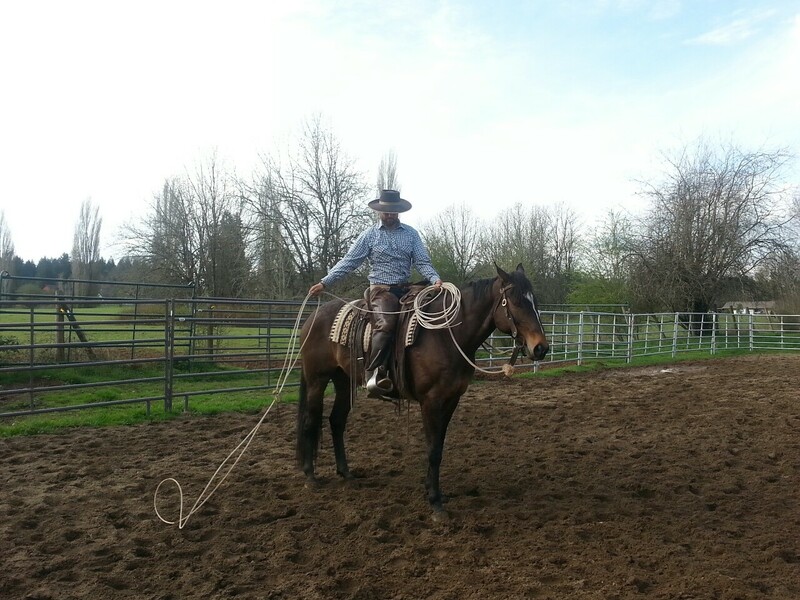 After 60 days of professional retraining, he was still a lot of horse, so SAFE and Pony Up negotiated a trade so that Kai could continue his training under the supervision of SAFE’s resident trainer. 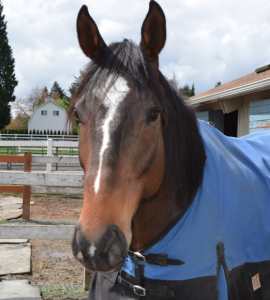 Kai’s first adoption through SAFE ended badly when his owner was unseated during a trail ride and broke her leg. Kai returned to SAFE, and went back into training. 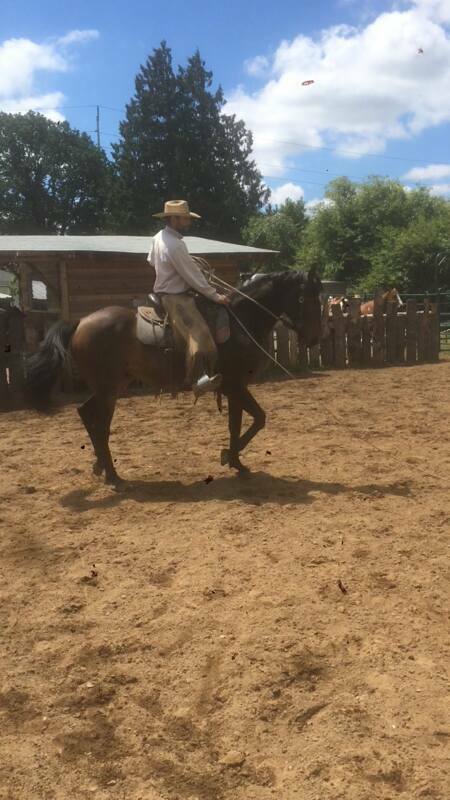 He was the first horse that we sent to Joel Conner for training, but it was a terrific success. Kai was ridden in a western saddle and even was used to rope cattle! We ended up with several people interested in adopting him, but we decided that the best candidate for this spirited young horse was Barb F. The two have a fabulous connection and are very happy together! 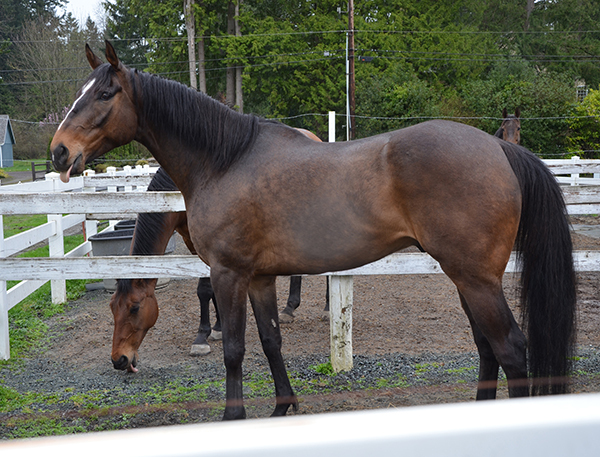 We had the amazing good fortune to visit some old friends recently: Anakin, Kai, Einstein, and the big hoss Strider. All four boys are living the good life in their neighboring adoptive homes. Thank you so much to Barb and Michel for inviting us over! Can’t wait til next time! Thank you to Lisa Garr for the photos! It takes a village to rescue, rehabilitate and rehome a horse and we all celebrate and share the success when one of the SAFE horses finds their forever home. We are excited to announce that our handsome boy Kai has found a loving home with Barbara F. He has just completed his trial period and while the relationship is still new they are all ready building a strong bond. Kai is a beautiful boy with as much personality as he has charm. 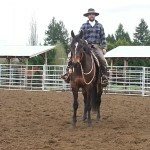 It was important to find him a partner that could match his energy and help him feel confidence and success as a riding partner. We knew right away this might be a good fit for Kai. 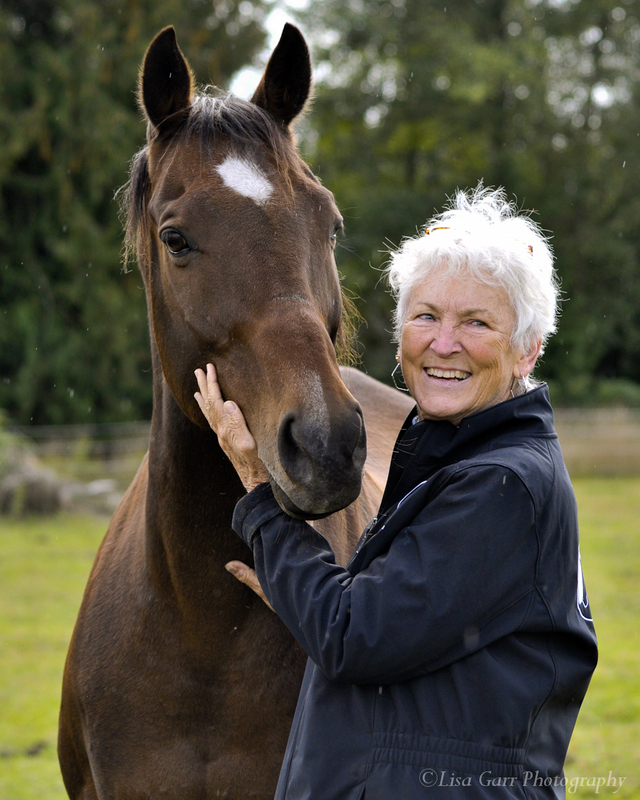 Barbara had experience with an energetic thoroughbred, acreage and space to provide him with a perfect home with lots of room to play and a network of knowledgeable equine friends and family to support her. If that wasn’t enough to get us excited, Barbara heard about us from her wonderful neighbor named Michel who adopted Strider and her daughter Corrine adopted Skye last year. 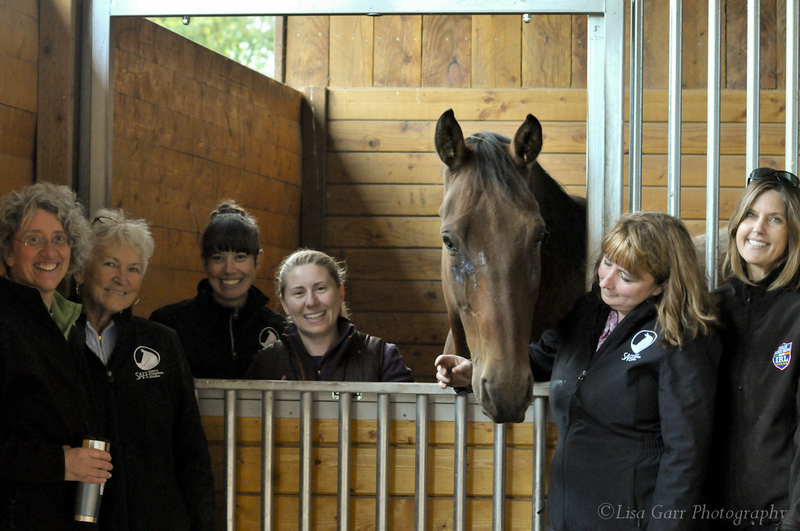 That’s right…3 of our favorite SAFE horses on the same block! Barbara came to Vancouver to meet Kai while he was in training with Joel Conner. It was remarkable to see what a transformation Joel had accomplished with Kai in just the 6 weeks of training. 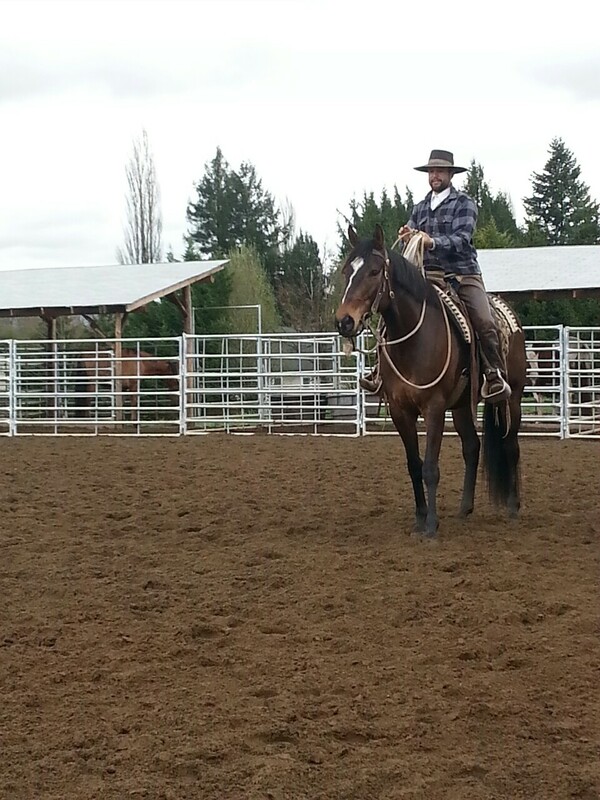 Kai could be distracted by things outside the arena and lose his focus on the rider. 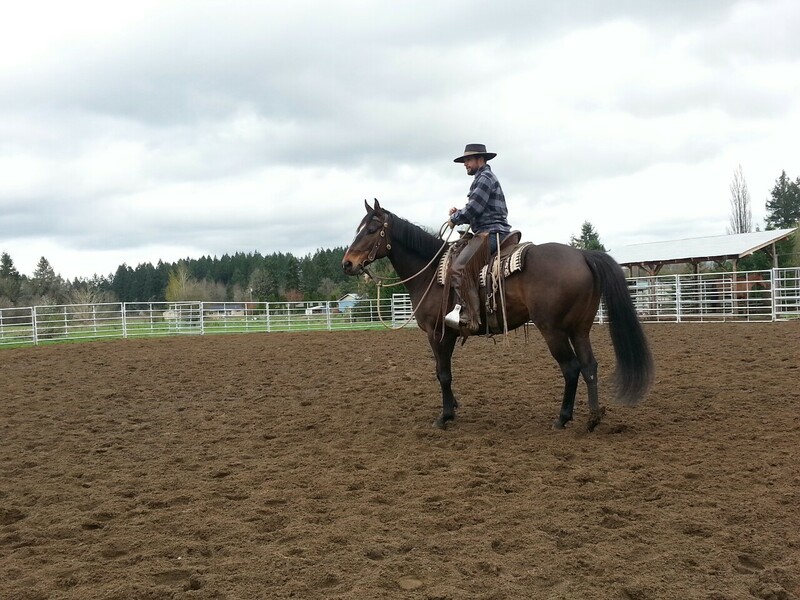 Joel’s work with Kai helped to give him the tools to come back to the rider and engage with what was being asked rather than to be lost and bolt or buck away. With these pieces now in place, Barbara had a good starting point to begin her relationship with Kai. 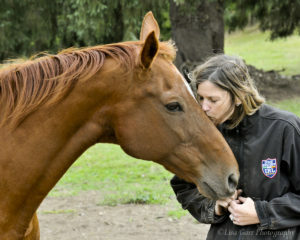 She left Kai at Joel’s for another 2 weeks of training while she readied her property and then moved him home. He is getting to know his new buddies, Strider and Skye, and finding out what it means to be truly loved and cared for by a person of his own. We couldn’t be happier to have Kai safe and happy with a family that loves him. 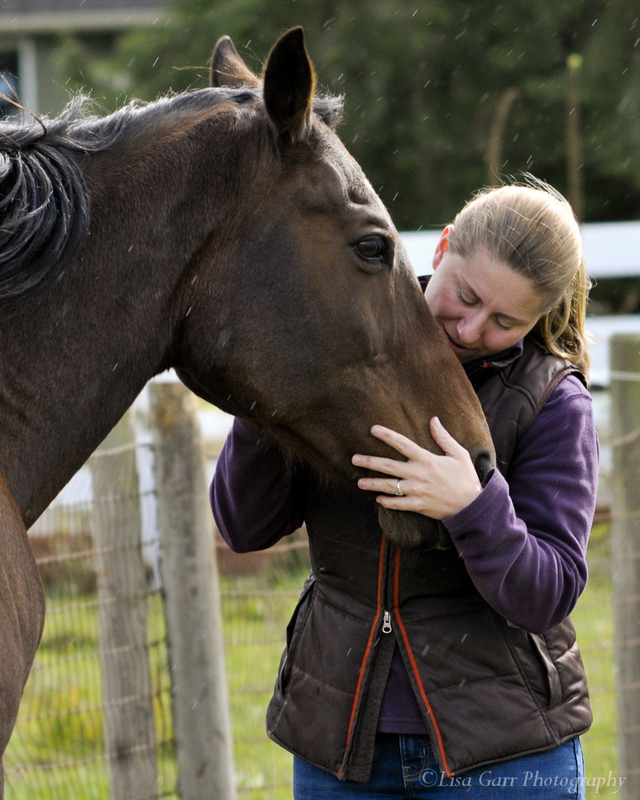 He has a big heart and it makes our work complete knowing that he is HOME and getting the affection, love and partnership he deserves for the rest of his life! We wish Kai and Barbara lots of success and love. 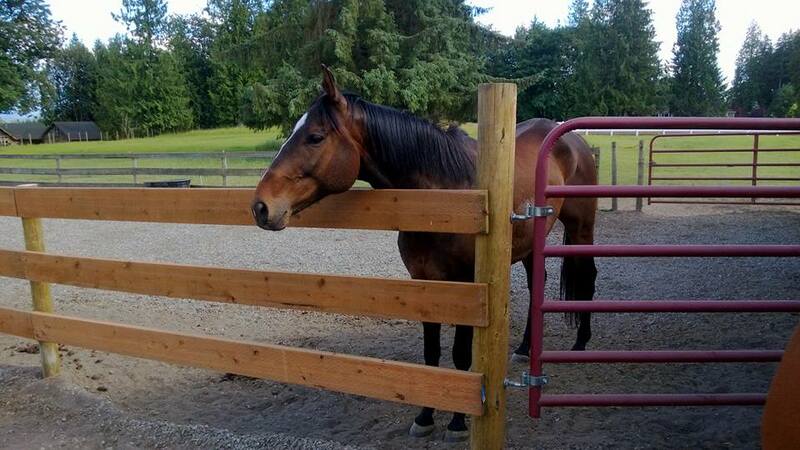 Kai at his new HOME! Kai with Joel in training. 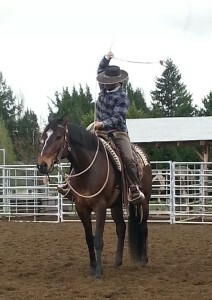 Kai and Joel roping a cow! 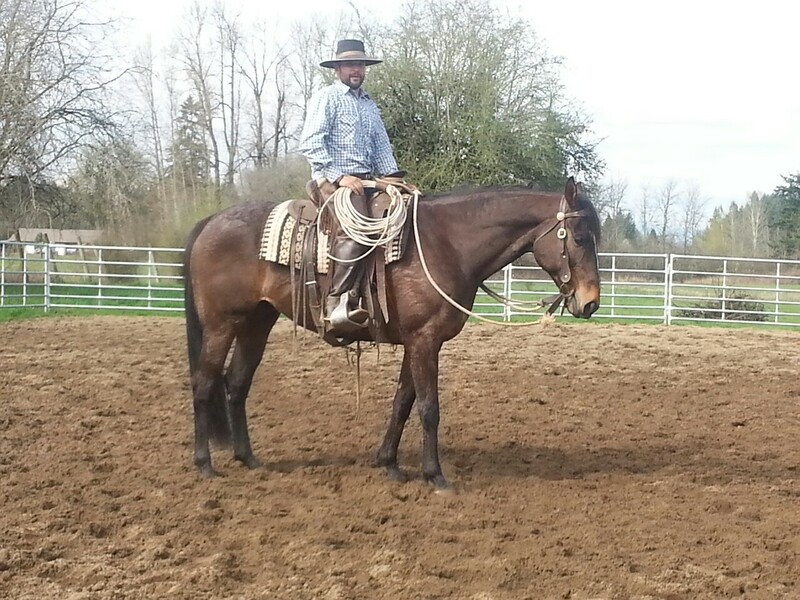 Kai is going very nicely for trainer Joel Conner in Vancouver WA. 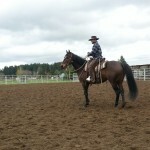 He’s made some great improvements, both in the ground work and riding over the course of his tune up training. There was a little setback a few weeks back when Kai cut his chin while playing over the fence. He is a playful boy who loves to play bite face with his neighbors. 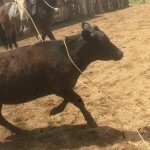 Joel moved him to a different stall so he would not have the temptation to get any more injuries but lost some training time while his injury was healing. After his recovery, Joel got back to work with him. He’s been very pleased with his progress since then. We have some very promising adoption applications for Kai, and he’s being shown this week to a few of them. 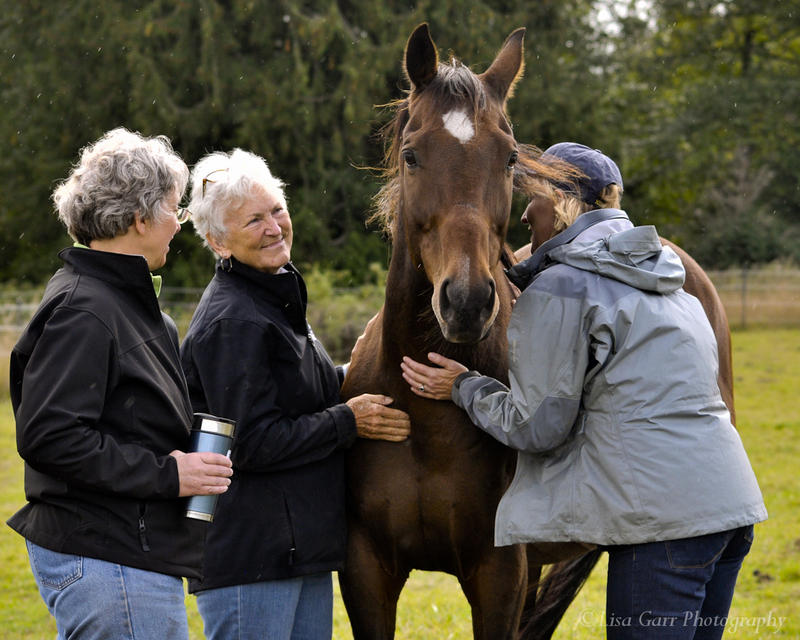 If he is not adopted before the end of the month, we’ll be bringing him back to Safe Harbor to continue working with our volunteer riders. 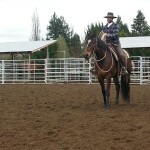 Kai is doing “amazing well” during his tuneup training with Joel Conner. 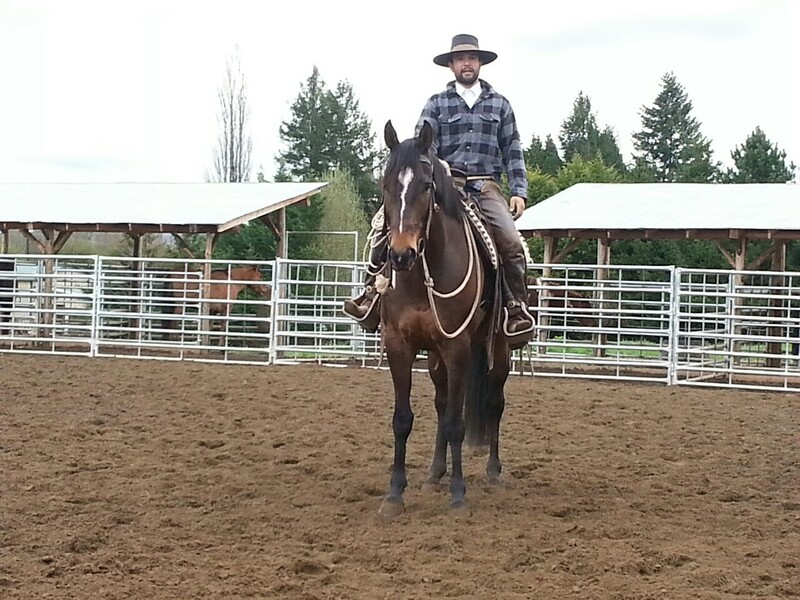 We couldn’t be happier with his progress and how soft, relaxed, and balanced Joel has him going. 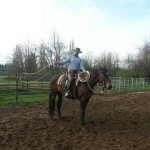 Take a look at these fun photos of Kai getting accustomed to a rope being thrown from the saddle and the weight of pulling the training log. 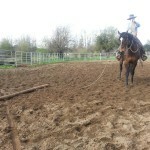 This work is building trust in his rider and teaching him to be more focused on what’s being asked of him. 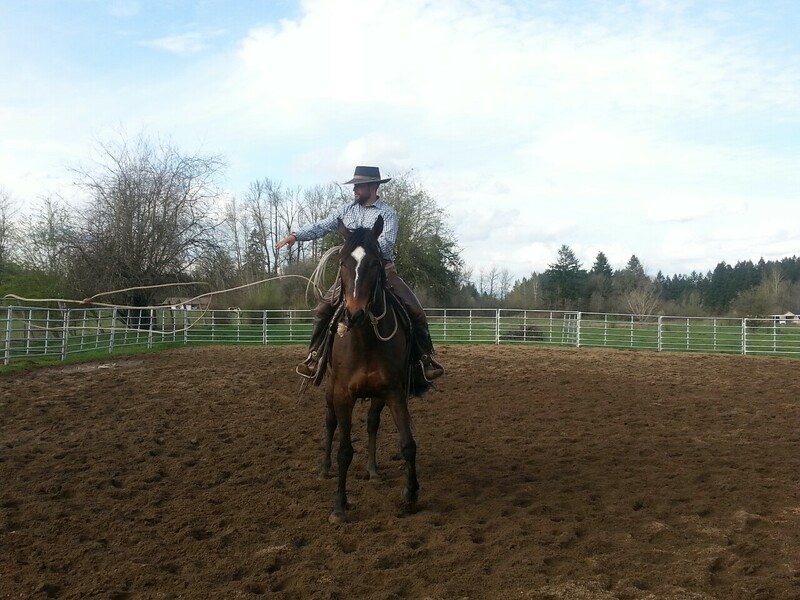 For his first time, he sure made it look easy! Kai left on Tuesday to spend a month in training with Joel Conner, who was recommended to us by Buck Brannaman. Kai made the 3 hour journey to Vancouver WA without a problem (thank you Chris T for hauling him!) and settled in nicely at Joel’s farm. 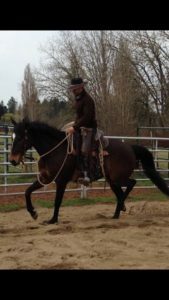 The next day we received this photo of Kai sporting a brand new look, and a report from Joel that Day One was a success and that he’s already quite fond of our big Thoroughbred gelding. Stay tuned for more updates! 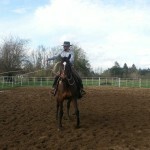 Kai did well for Stephanie in the Michael Sparling Clinic. He was, as Michael put it, the trickiest horse that came to the clinic. 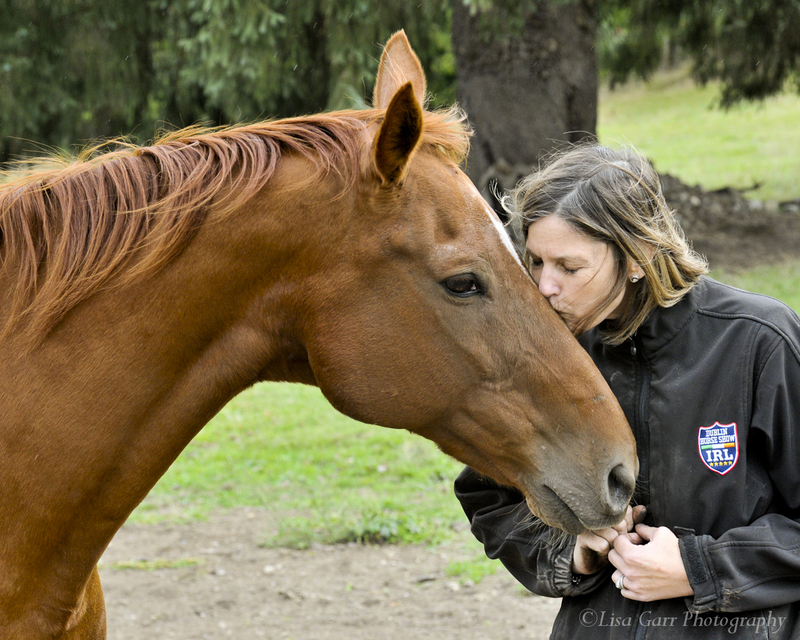 To ride Kai successfully, your timing has to be dead on and you have to be right there to support and help him find balance. It is important to “get in and get out” and not to back off or be off in your timing. Michael worked with Kai each day of the clinic with Stephanie. 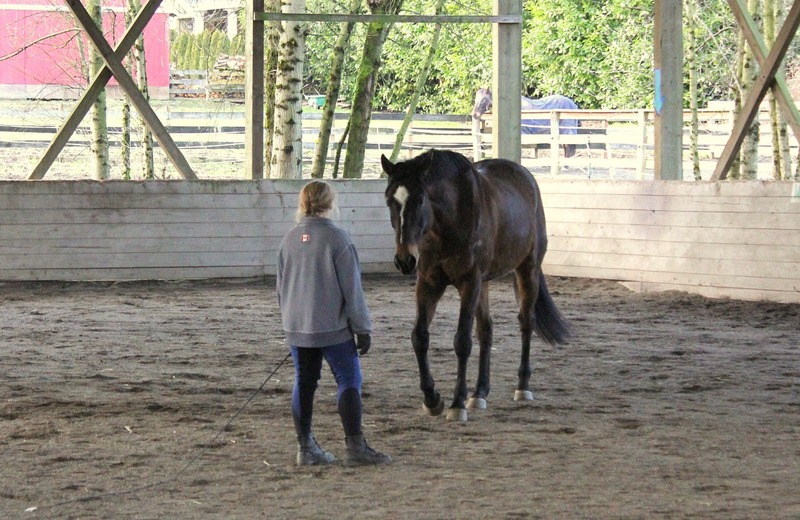 He also donated a private groundwork session on the last day where he really helped Kai see what was being asked of him and made some good progress. He agreed that Joel Conner would be a very good trainer for Kai’s tune up and would help get him through some of the riding issues. Kai needs to engage his core, lift his back and learn to use his body properly and Joel can help him do that through his training. Kai has a harder time doing this to the left. 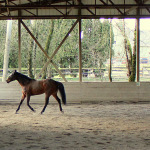 The goal is that Joel will be able to loosen Kai up in any braced spots and find engagement in his hind. Poor Kai had a few hoof abscesses this month. We have been treating them and all are healing up well. 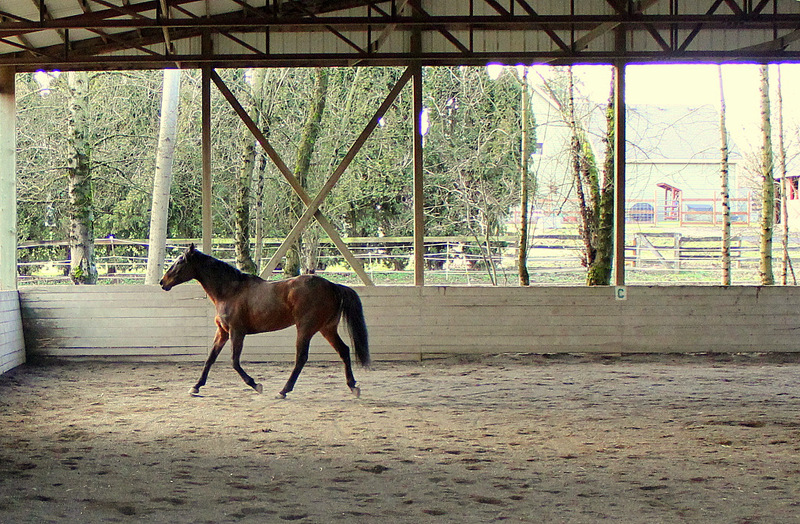 We are working him in boots, and that seems to be helping with his front foot tenderness. He is holding a good weight through the winter. We are looking into getting him some bodywork to help with his physical strains. The area that needs the most attention is his left sacrum, which can get tight and cause him muscle discomfort. We had a donation of acupuncture in the beginning of December that really seemed to help loosen up the area. We are looking forward to seeing if a repeat visit has the same effect. 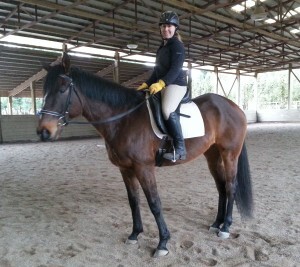 Kai is doing wonderful for both his riding work and behavior. 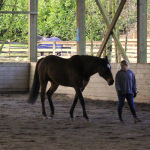 He is getting to spend a few nights a week in the arena for turnout which has been great for his energy level and training rides. We are working right now to clear up some thrush in his front feet. Wet weather and thoroughbred feet are always a tough combination but we are staying on top of it and getting it cleared up. He is being a great boy for the treatment. 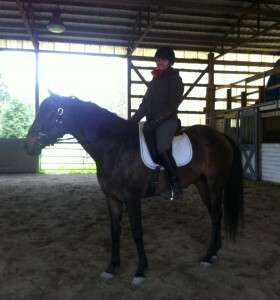 I’ve had some wonderful rides on Kai this month where he was feeling stronger and showed some good self carriage. 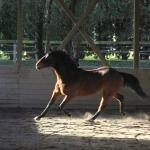 I started working on sitting trot and found he is not ready for this on his weak back muscles. 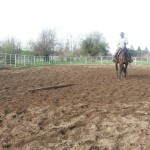 I will continue to slowly introduce more of this over the month and work on balancing forward aids with transitions and getting him to rock back on his hind quarters more. He has a little confusion when asked to stay engaged and sit but he will be able to do this on a more constant basis as he strengthens. Can’t help but love this big hunk…somewhat distant exterior, but a heart of gold underneath for the right person, and, if you work for it, tons of easily offended dignity. He is the type that really doesn’t like to be laughed at or have his many ideas dismissed or ignored. If he gets emotionally hurt or rattled, he reacts with grumpiness but he doesn’t really care that much about your love or praise. He likes the “Socratic method,” he will look at a request or task from every angle and test every one out before he gives you what you ask for. You have to earn stuff with him, he won’t just give it to you because you want it and it makes you happy. 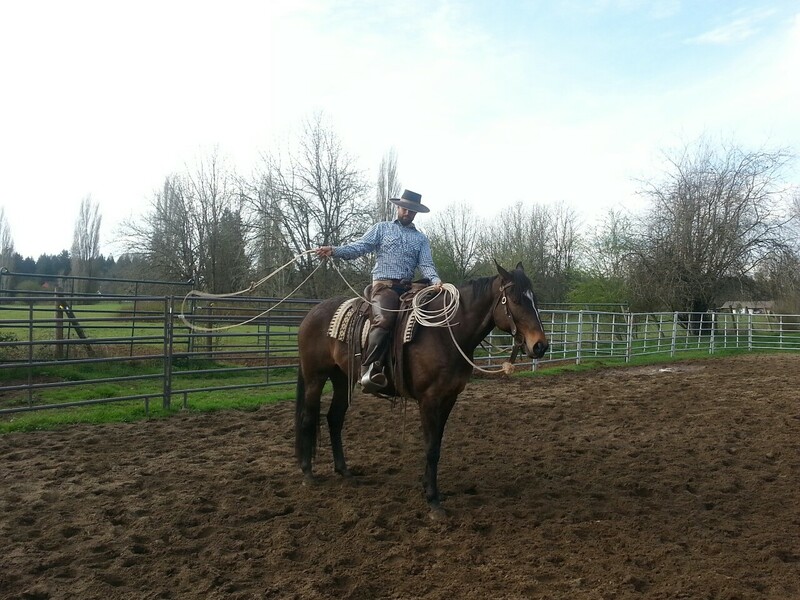 Horses like this can be difficult to motivate but once they partner up they take a lot of pride in their team work. He absolutely can learn to do things properly, but for instance where Dottie is open, interested, and eager to work for approval, Kai’s initial reaction to any request is usually “no” or “why should I?” He doesn’t particularly care if some random person thinks he’s being “good” or not. With time and once you establish respect, with a good, loving relationship, that will change. He’s not mean, dangerous, or ill‐tempered – he’s just not a pushover or particularly social. Maybe a little bit suspicious by nature, and sensitive to being slighted. My guess is he will be slow to come around, and need to “date” his person for a while to establish that relationship. Not so much that he’s slow to trust, but more that he’s slow to warm and let you completely connect. 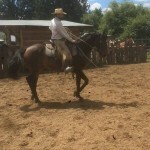 The rider will needs to be calm, very patient, consistent, and understand his “way” without rushing him. He will loses confidence and become very braced and resistant if you don’t let him work thought things in his mind. You need to respect that he has to work through his own natural resistance to requests. If you are consistent and fair, keep saying try this and then praise his success, he will come around and do it well. It may just be a bit of a road to get there. He’s got to explore all his options, and see if you have the staying power to last through it. The process is to be consistent, fair, and kind, and always respect his dignity. 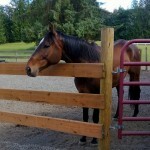 Kai is back at SAFE Harbor and is once again available for adoption. 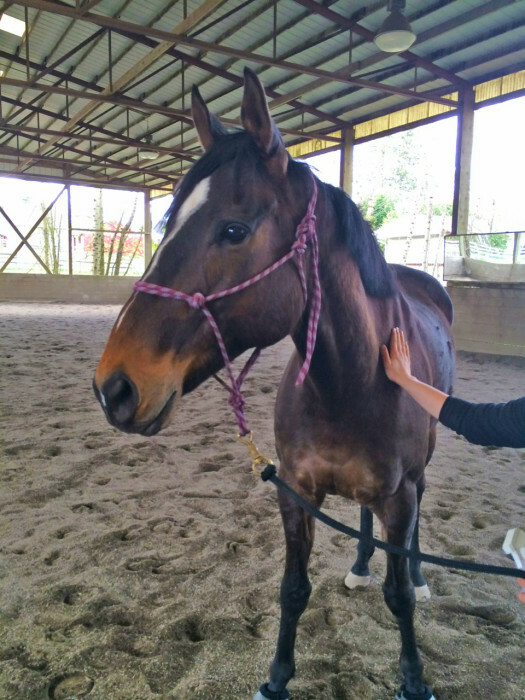 Kai was adopted earlier this year to a rider looking for a horse to do low‐level eventing and trail riding with. After an extended trial period, things were going quite well for Kai — he was enjoying long rides in the park at Bridle Trails and he was excelling in his lessons over fences. But several weeks ago, during the onset of fall weather, Kai and his adopter were walking on the trails in the park when Kai suddenly spooked, spun, and bolted, unseating his rider. She came off and almost landed on her feet, but the impact resulted in two fractures in her lower leg. 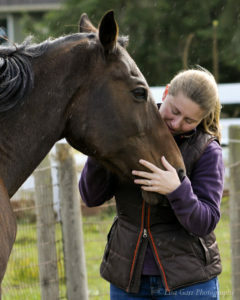 She ended up having surgery followed by 12 weeks of recovery with no riding. 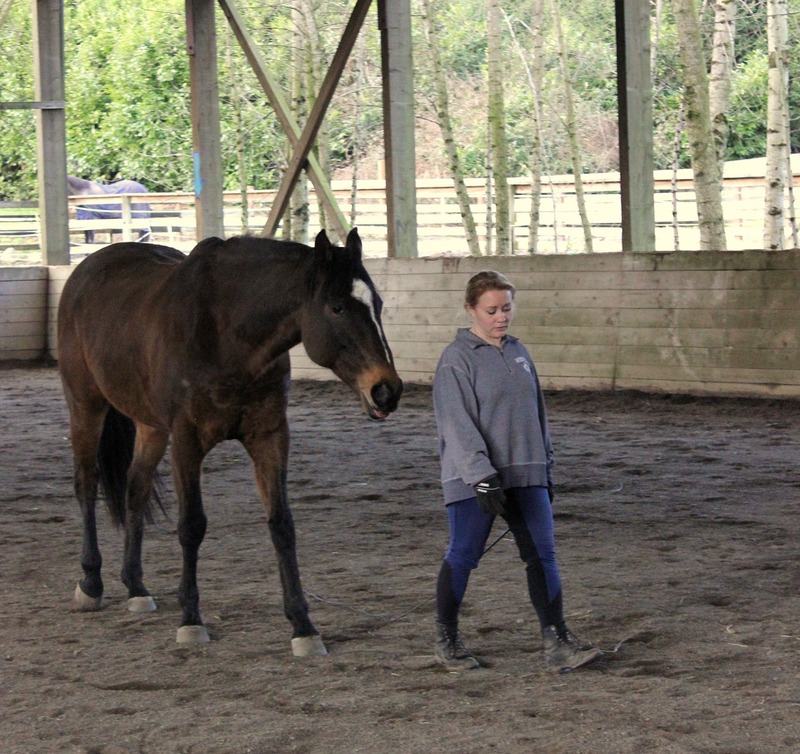 I spoke with Kai’s adopter about the incident at great length, and she agreed that it was definitely an example of a “young Thoroughbred moment” and that Kai has just momentarily lost his brain due to whatever he saw that caused him to spook. She was very clear that he had done nothing wrong, and had not behaved dangerously or done anything intentionally that caused her to be hurt. But after giving it a great deal of thought, she asked SAFE to take Kai back. Her accident and injury caused her to rethink her decision to adopt this young, athletic horse, because, as she wryly commented, at a certain age, “we don’t bounce the way we did when we were younger.” Her concern was that she would be worried about falling again and communicating that fear to a sensitive horse like Kai might not end well. 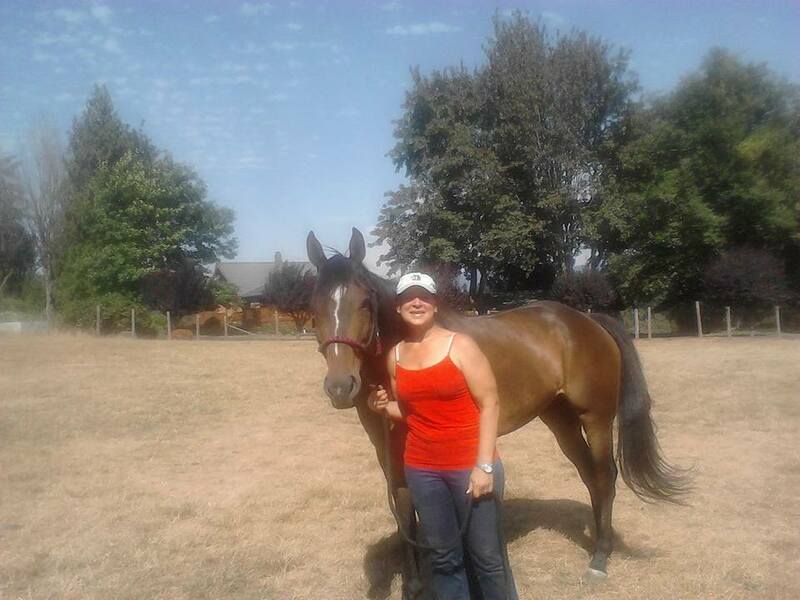 Despite the logic behind her decision, she still struggled with it a great deal because she recognized that he’s a quality horse, the likes of which don’t come along that often. 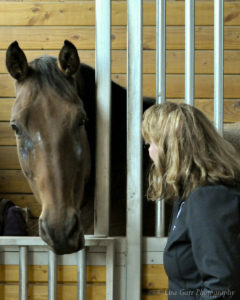 And she was very fond of him and his sweet, snuggly personality. 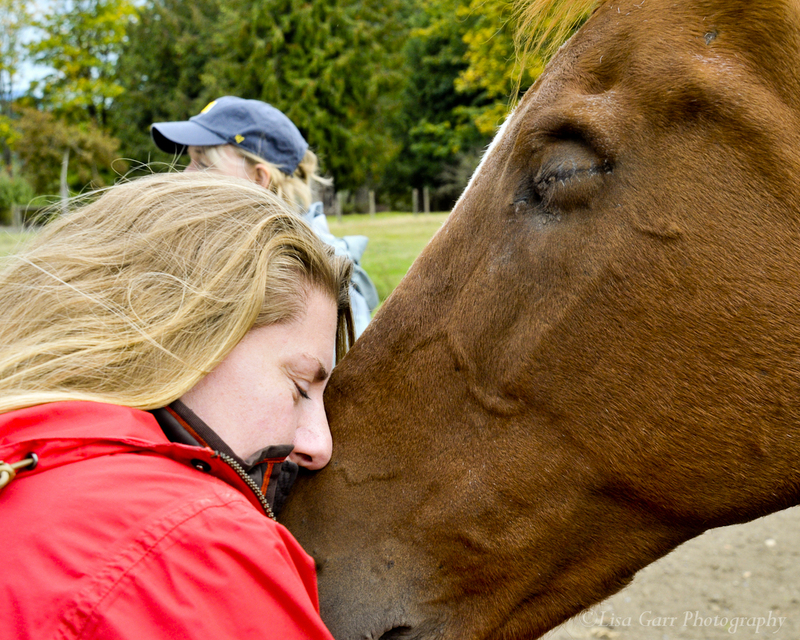 But in the end, she made the decision that he wasn’t the right horse for her, and we agreed to take him back. 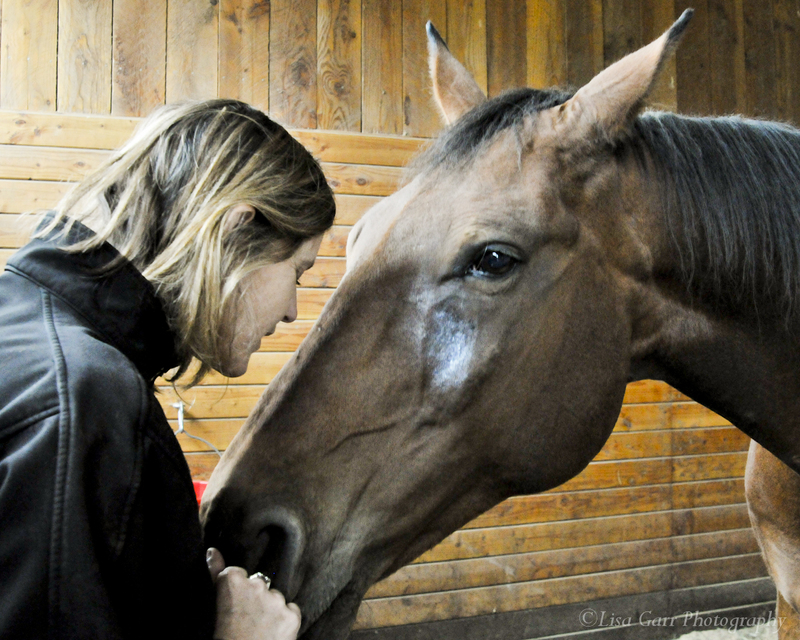 Since he’s been back at SAFE Harbor, Kai’s been reunited with trainer Brittney Stewart, who has always really loved riding this horse, and the two of them are back at work. 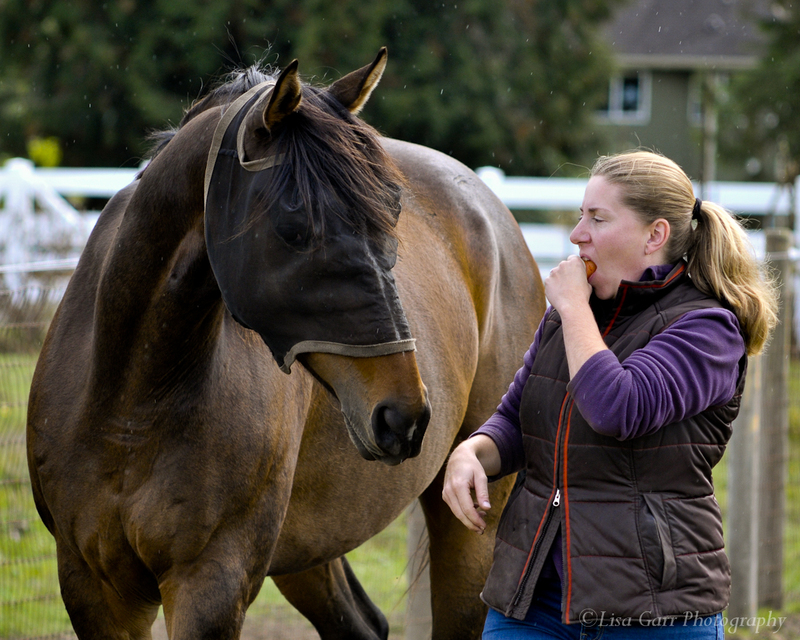 Brittney says that Kai has lost a little bit of conditioning since he left SAFE earlier in the year, so they are working on building up his muscles and his top line and getting him fit again. 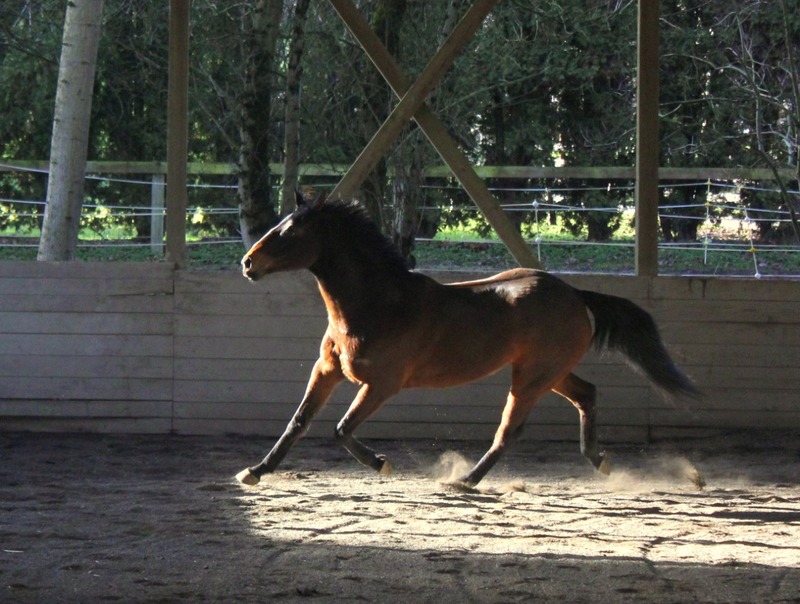 Once he’s back in shape, she plans to take him on a field trip to work on jumping (the arenas at SAFE Harbor are a little too small to safely jump in). We are offering him for adoption right away and hope to find an experienced, confident rider who can deal with an occasional spook from an athletic young horse. Kai’s adopter told us that his spooking behavior was pretty much limited to the trails, and that he was good as gold when working in the arena. She also said that he did great in his lessons over fences, and was extremely brave and willing, and really seemed to enjoy jumping. 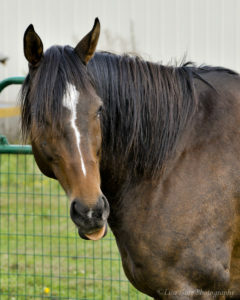 If you are interested in Kai, you can find the SAFE adoption application online by clicking here. 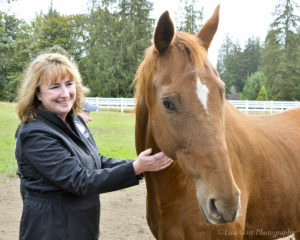 Kai has spent the past few months out on trial with a potential adopter…and we are delighted to announce that Debbie G of Bellevue WA has decided to go forward with the adoption. Kai resides at a beautiful farm on Bridle Trails State Park and Debbie takes him out on the trails nearly every day. Kai apparently loves trail riding and has been doing great with it. Debbie is also planning to do low‐level eventing and hopefully even field hunting with him…but Kai has a lot to learn about self‐control before that can happen. 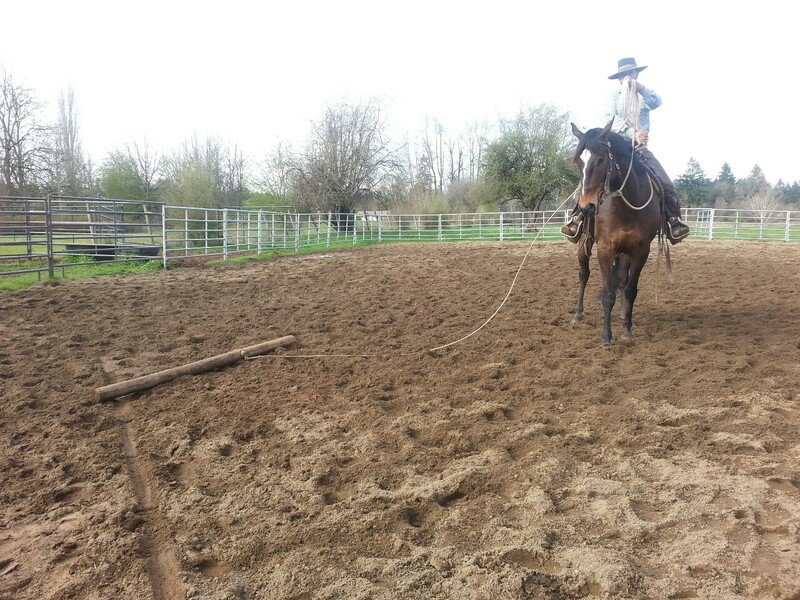 He’s already had some jump training, which he also seems to love, and Debbie tells us that she had a great lesson on him jumping 2′9″. Congratulations to Debbie and Good Luck Kai!! 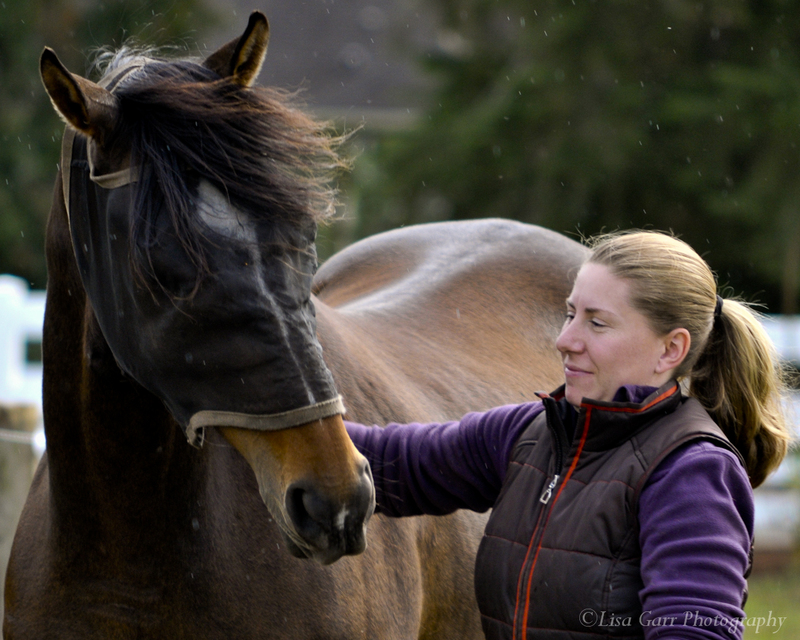 SAFE Trainer Brittney Stewart has had the opportunity to work with Kai a few times now, and she’s pretty pleased with what she’s seen from him. 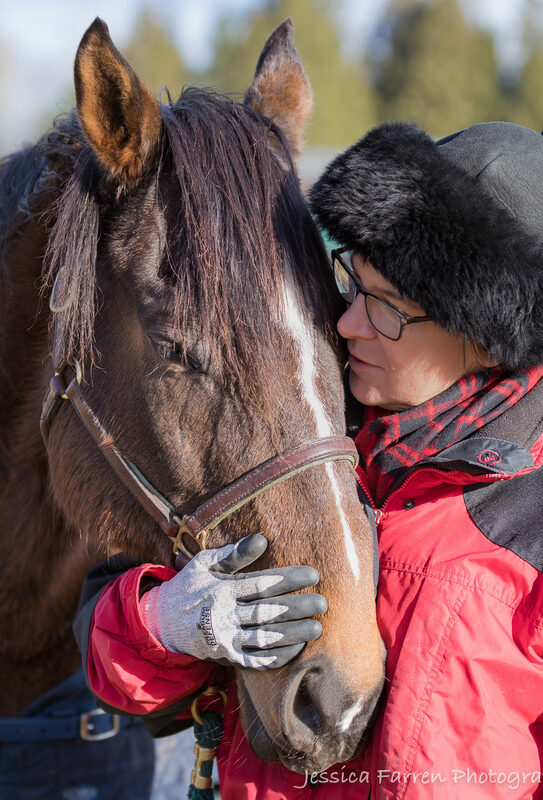 He’s very green, of course, but unlike many of the off‐the‐track thoroughbreds she’s ridden, she finds that Kai listens to her seat and outside aids, so he obviously got a good education from his first trainer, Cam Reeves. 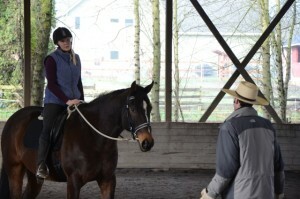 Cam was also successful in teaching him not to bolt, and while Brittney isn’t giving him opportunities to try that with her, she did note that during a recent ride, when a tarp was snapping outside the arena, Kai really “tried to hold it together” and was a good boy about the whole thing. On their first session together, he gave her some grief about bridling, but he’s since given up that behavior as well. Here’s a video from today’s ride on Kai. 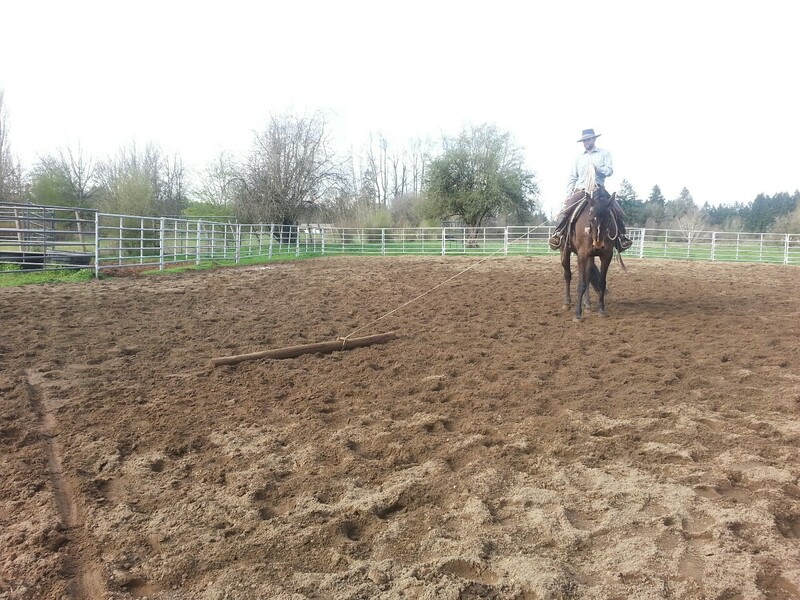 Brittney said that this was her last ride of the day, and after riding 7 other horses, Kai knew she was tired and made her work a bit harder than she wanted to, but overall he was a good boy and didn’t do anything silly. 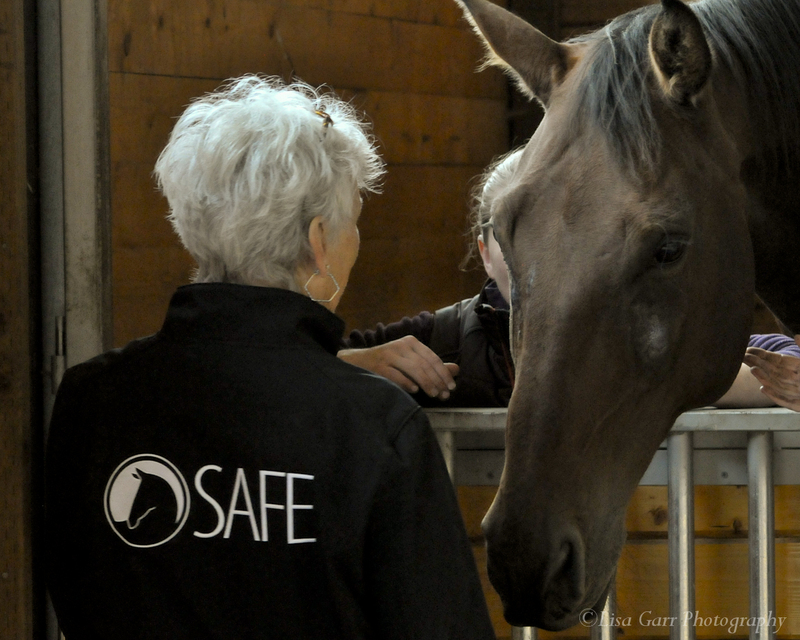 Welcoming a new horse to SAFE! 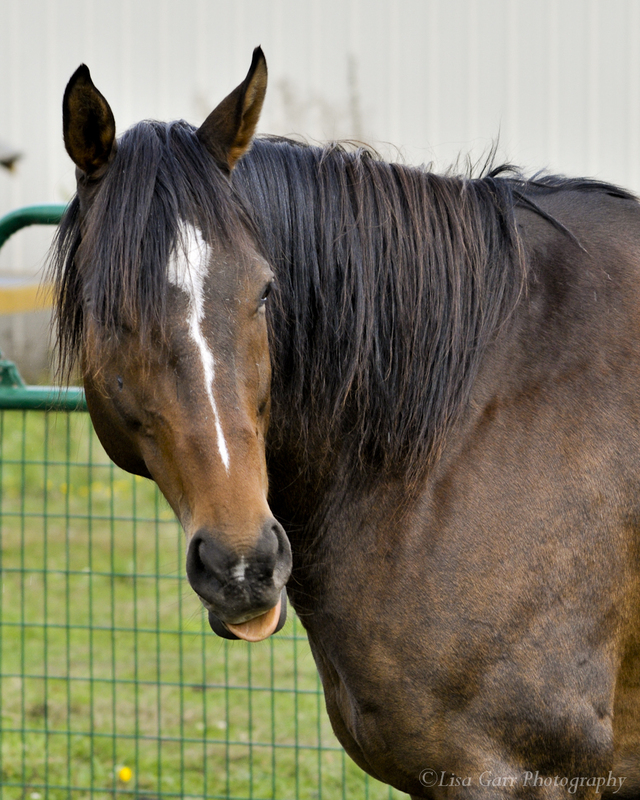 Kai might look familiar to those of you who also support Pony Up Rescue for Equines, and that is because he was originally rescued by Pony Up about a year or so ago, and you probably know him as Sky. 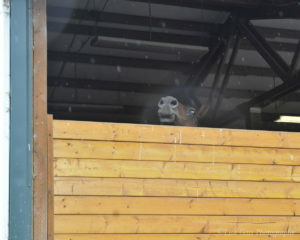 Pony Up was contacted by Sky’s owner who could no longer keep him, and when they took him in, he was in very poor condition with rain rot and bad feet. He had not had much if any training or handling beyond what he got at the track. 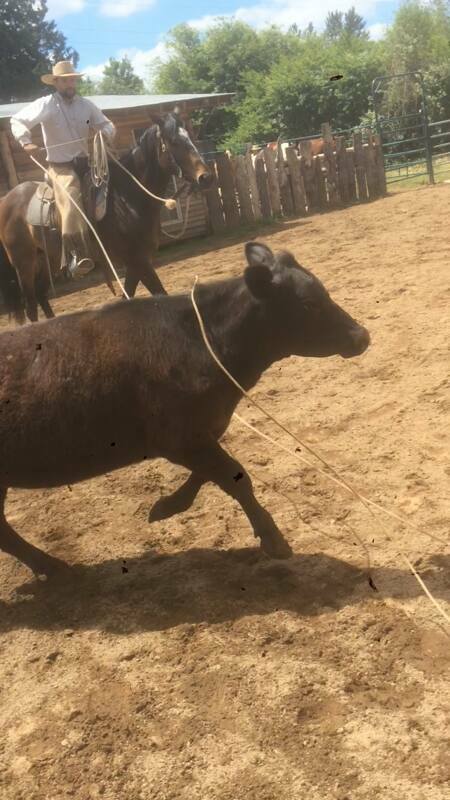 Pony Up did a fantastic job of getting Sky rehabilitated and back to health, and then sent him to Cam Reeves at The Jones Farm for retraining. 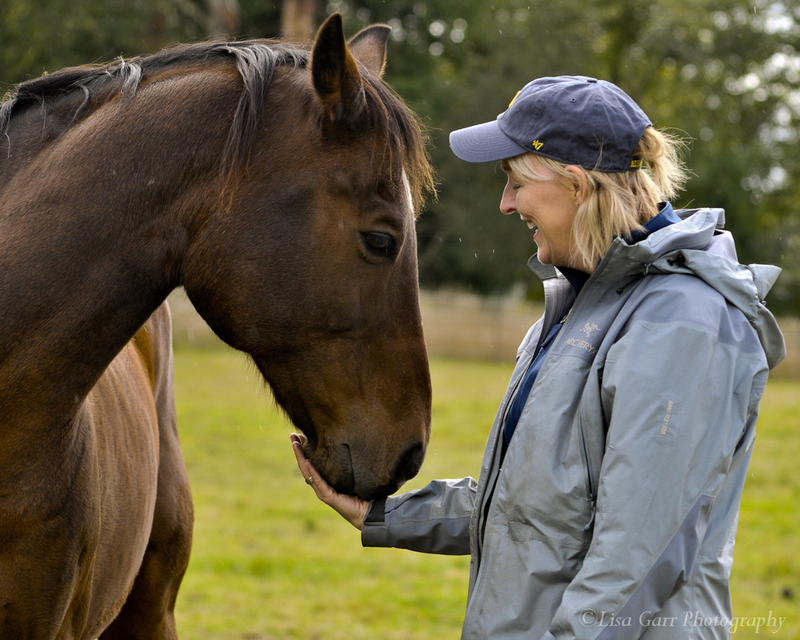 He had 60+ days of training with Cam, who guided him through the transition from racehorse to sport horse, working him 6 days a week and giving him an excellent start towards a new life. Pony Up founder and President Rosemary Collins recognized that while Sky “passed” his training with flying colors, he was still not a beginner horse. She also knew that when he returned to her farm in Olalla, his training would more or less come to a halt, since she does not have a volunteer rider available at the moment who can continue Cam’s work. So she called her good friends at SAFE and made an interesting proposal: why not arrange a trade? 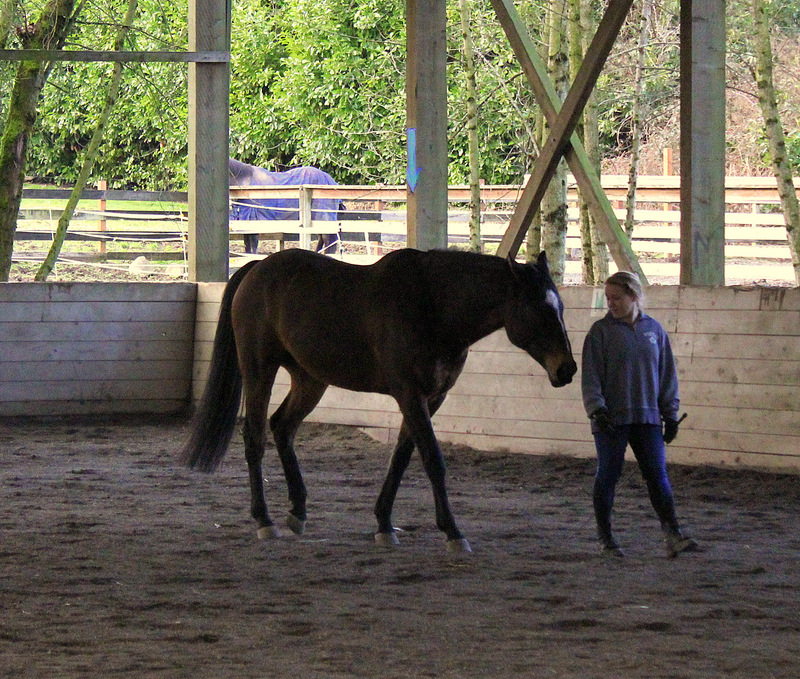 SAFE is very fortunate to have a talented dressage rider and trainer on staff who can continue Sky’s training, so sending him to SAFE makes a lot of sense in terms of Sky’s future as a sport horse. At the same time, Pony Up has an older gelding named Valentine who needs a kind and gentle turnout buddy, and SAFE has just the fellow: JR — whose ongoing soundness problems recently made it necessary for us to “demote” this wonderful gelding to “pasture companion” status. 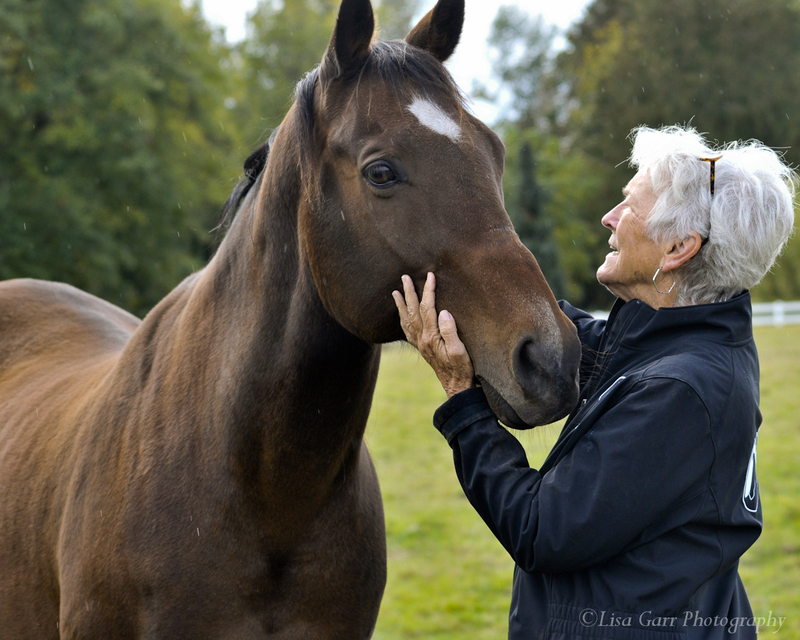 We know that Rosemary and Pony Up are great with the care and feeding of Thoroughbreds, and the idea of JR living in a situation where he will be turned out with a friend made us feel like this trade was meant to be. So yesterday, we picked up Sky from The Jones Farm and brought him to SAFE Harbor, and delivered JR to Pony Up’s Starfish Ranch. 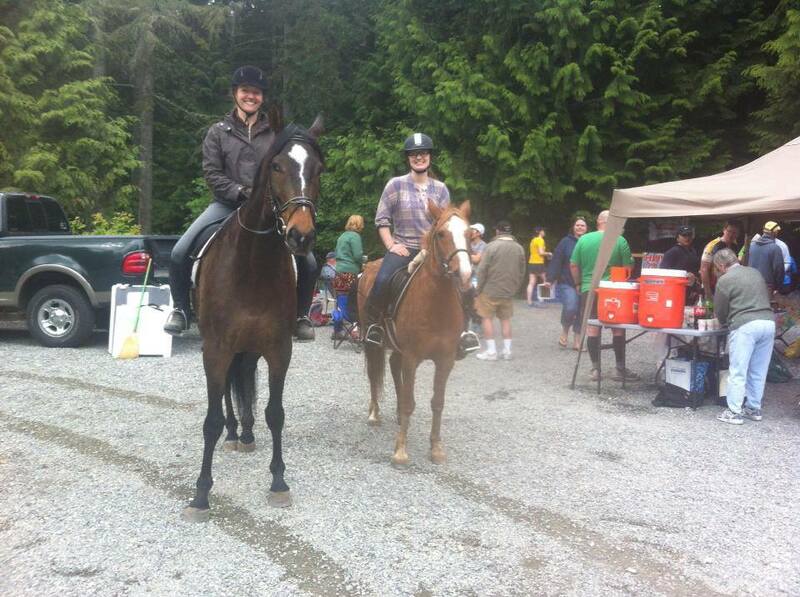 JR’s trailer ride yesterday was unbelievably long due to horrible traffic (!!) 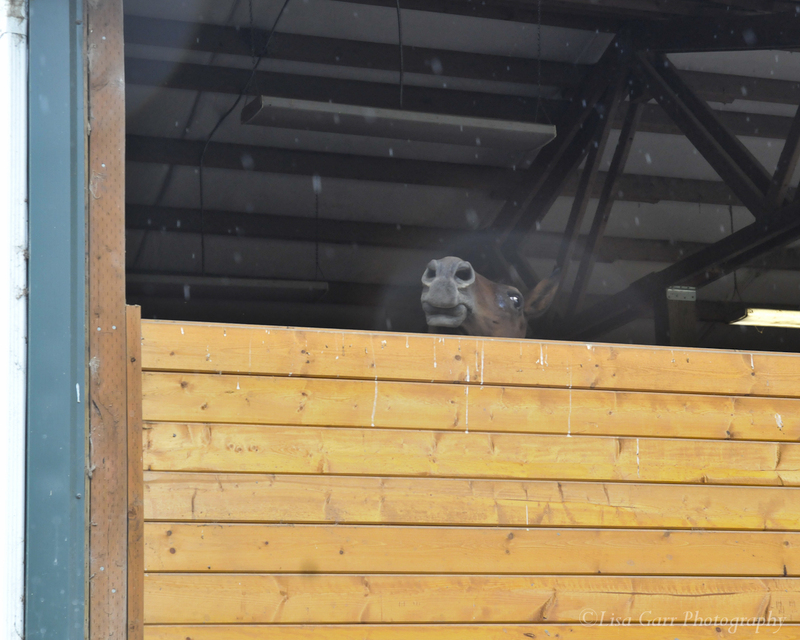 but he arrived safe and sound, and had a nice, clean stall waiting for him. He met his new buddy Valentine through the paddock fence and both horses were very friendly and interested in each other, which bodes well for the future. 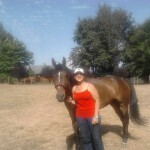 At SAFE Harbor, JR was a great pasture buddy, very submissive (even to Sinatra!) and so we have our fingers crossed that he and Valentine will be close friends. 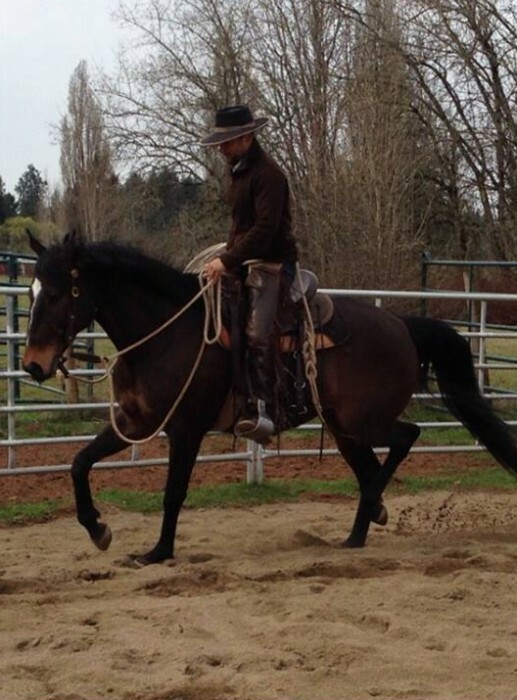 JR will probably also get to do some light trail riding while at Pony Up, and he’ll participate in Pony Up’s “Neigh Days” that include pony rides for kids in the community which he’s sure to enjoy. 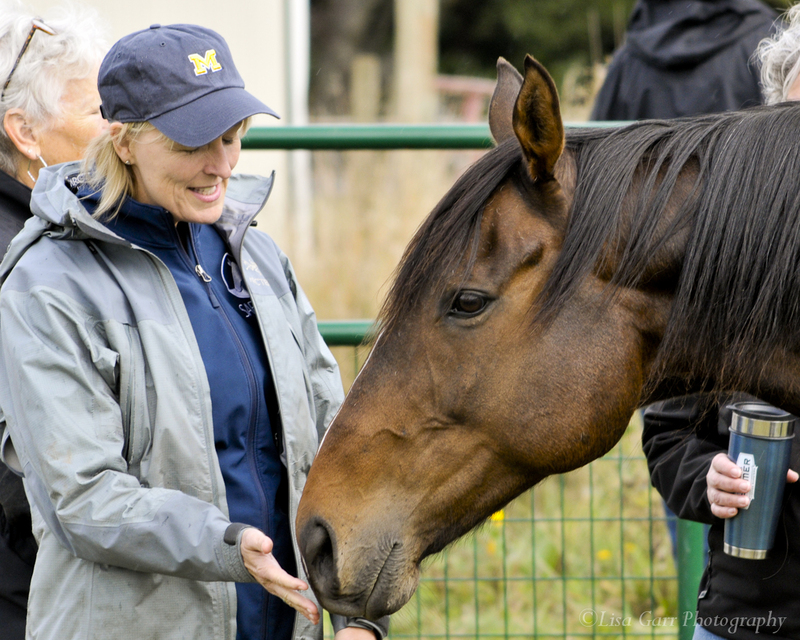 We are really going to miss JR at SAFE Harbor Stables…he was a favorite to lots of volunteers, but we know that he’ll be getting the best of care as a Pony Up horse. 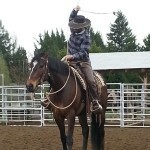 Trading horses is something we’ve never done before, but it makes sense, not only for us, but for Sky/Kai and JR too. 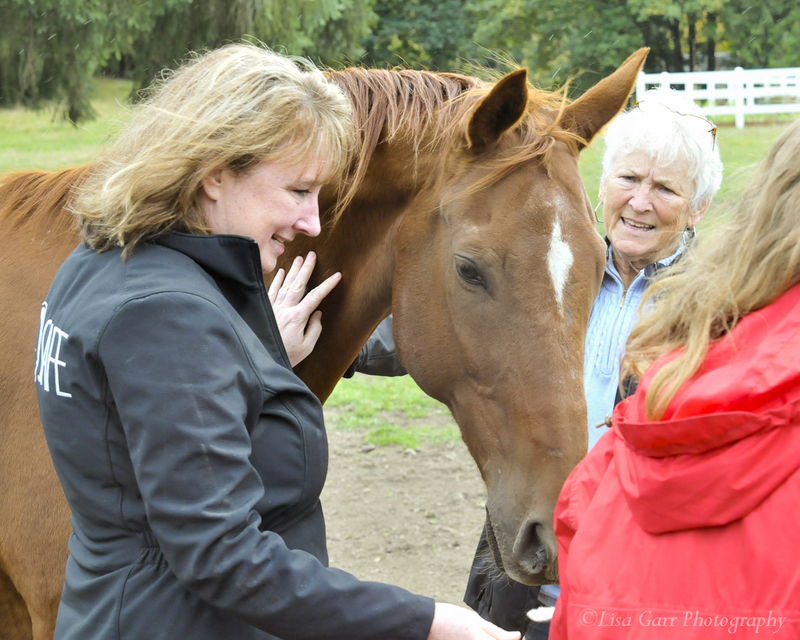 We are grateful to Pony Up for all their hard work helping horses in this area; they are a great organization doing great things. 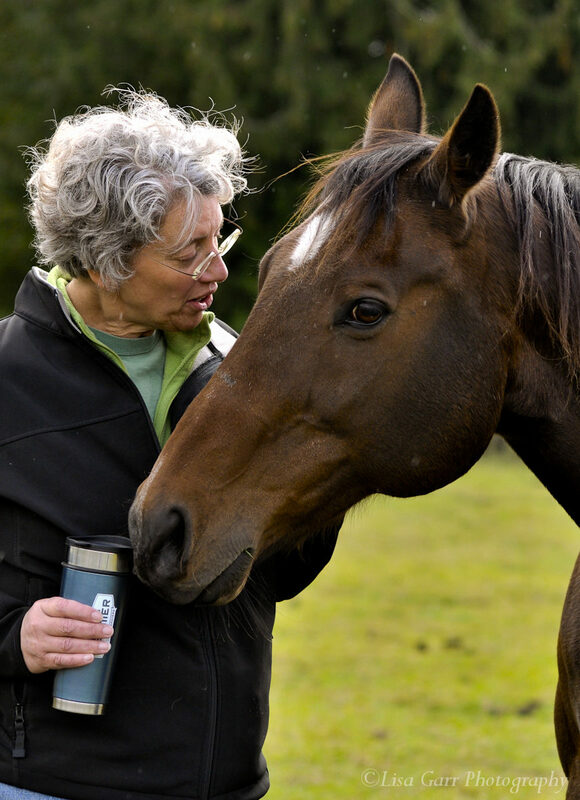 It’s important that rescue organizations like SAFE and Pony Up are able to work together and help each other, because it only makes things better for the horses. We look forward to continuing to work in cooperation with Pony Up! 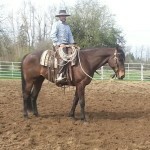 We’ll be taking the next few weeks to get to know Kai and evaluate him under saddle before offering him for adoption. 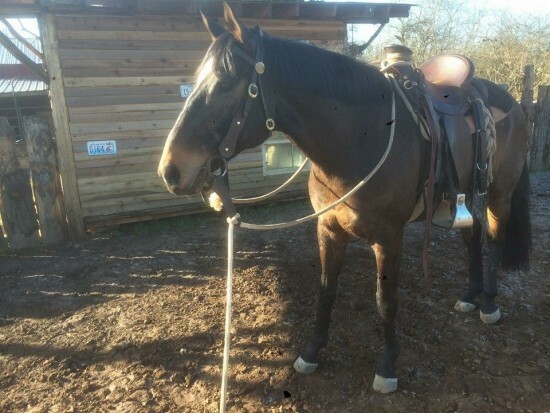 But if you’re looking for a young sporthorse prospect wrapped up in a gorgeous package, take a look at this handsome fellow! More about Kai can be found on his page here.